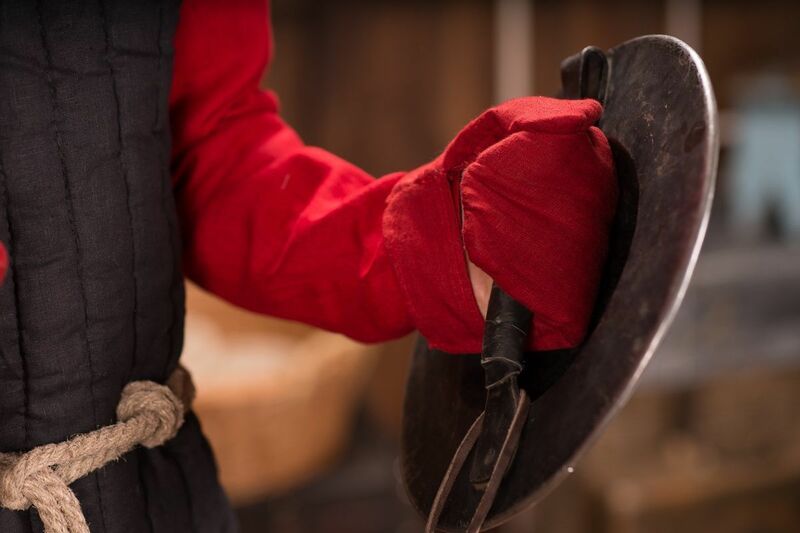 Hand's safety is one of the most important factors during medieval fencing. 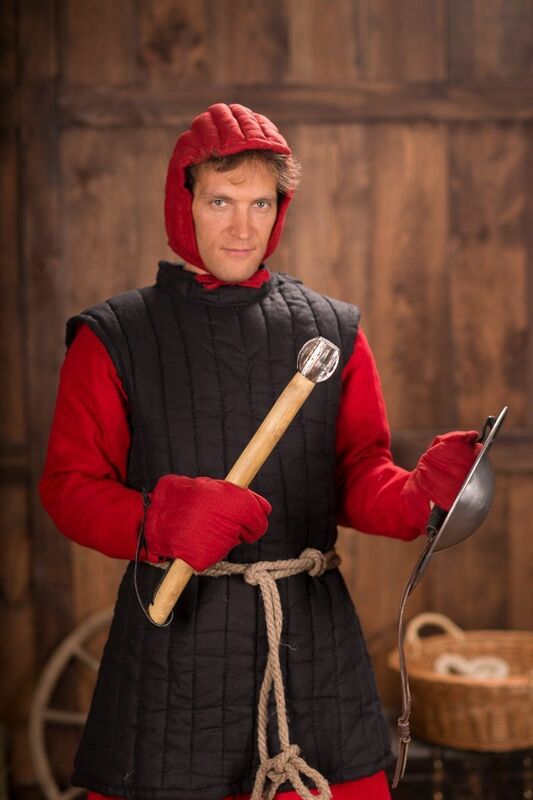 The padded mittens were the perfect protection in the XII-XIII centuries. At the same time, they were providing a good mobility of hands. 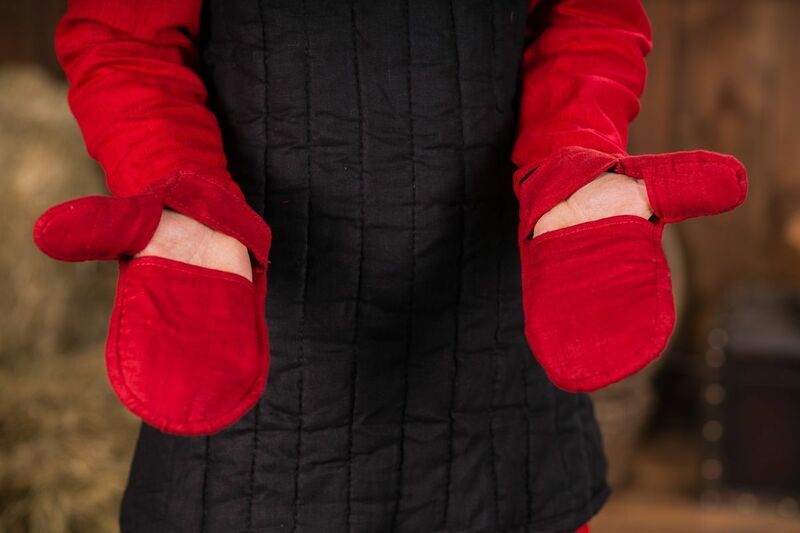 Padded mittens with cut on the palms are made of natural 100% materials and provides perfect hold and protection. They are very important part of the medieval soldier's costume. Different colours are available for order in the options. Please contact us via e-mail at [email protected], if you have any regards or questions of this model. These 2-finger padded cotton gauntlets give a good protection for hands during medieval swordcraft training or fencing. In basic model they are made of: - outer shell and liner are made of 100 % natural uncolored cotton - palm part is made of 2 layers - staffed with natural thick wadding Different colours are available for order. .. These 2-finger padded cotton gauntlets with leather patches give a good protection for hands during medieval swordcraft training or fencing. In basic model they are made of: - outer shell and liner are made of 100 % natural uncolored homespun-kind cotton fabric - palm part is made of leather - staffed with natural thick wadding Different colours are available for order. .. These 3-finger padded cotton gauntlets provide a good protection for hands while medieval swordcraft training and fencing. In basic model they are made of: - outer shell and liner are made of 100 % natural uncolored homespun-kind cotton fabric - palm part is made of 2 layers - staffed with natural thick wadding Different colours are availabale for order. .. These 3-finger padded deerskin gauntlets provide a good protection for hands while swordcraft training and fencing. Padded gauntlets are stuffed with natural wadding, have outer shell is made of deerskin, and inner shell is made of 100% natural cotton. Palm part is made of leather. Custom-made gauntlets could be made of leather or deerskin, with leather or deerskin insets over them. .. When one tells “armor”, everybody around imagine something dreadful and shiny, knightly and brutal. Something, in which you can punch each other with heavy iron pieces with full-force and be unhurt. But, as it turned out, true armor is not only brutality of metal, and not only elasticity of leather buckles. 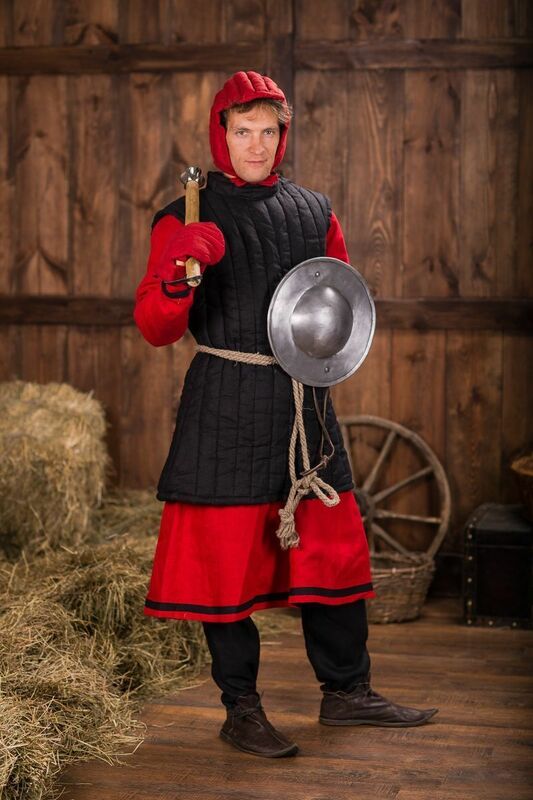 True armor, in which you may get a halberd’s blow and keep a whole skin, has a good base – soft padded gambeson and mittens. 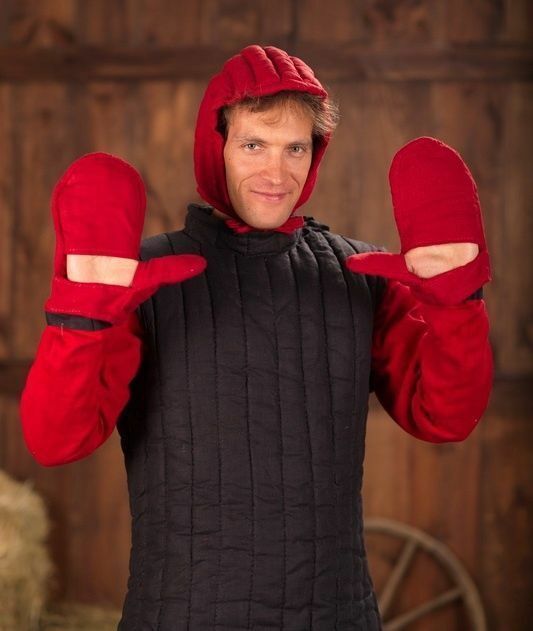 Here is nice and comfy mittens, on which you will wear metal fist or plate gauntlet, hold tighter your weapon and jump into action. Mittens seem a little funny, but its contribution to your hands’ protection is not less than plates’ one. Order padded mittens of linen or cotton in any color: black, natural (uncolored), yellow, red, royal blue, white, brown, wine red, dark blue. In category “Padded gloves and mittens” you may see all models, which we offer for you. Remember that your armament starts exactly from it. ..